A Mountain Tucson sits just west of the I-10 Freeway near downtown Tucson. The former name of A Mountain Tucson was actually Sentinel Mountain. That name was derived from its use as a look out point by the Spanish in the late 1700’s. It is part of Tucson history. That changed in 1915. Followers of the University of Arizona football team whitewashed a large “A” on it to celebrate a victory over Pomona college. From that frivolous event, a tradition was born. 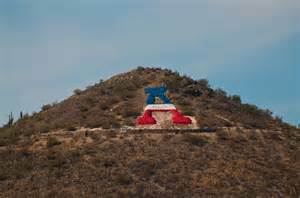 Each year the “A” on A Mountain Tucson was redone. Today a permanent red, white and blue “A” can be seen on the east side of the mountain. Please note that if it is ever painted green, it’s to celebrate St. Patrick’s Day. And now for the TMI (that’s “Too Much Information”) part of the story. A Mountain Tucson or Sentinel Peak rises 2,897 ft above the base. An underground ridge once forced groundwater to the surface. It provided water to the local farmers until the 1930s. The village of Schook-schon (Tucson) was visited by Father Eusebio Francisco Kino in the late 1600’s. Tucson was a few miles east of Sentinel Peak. In 1775 the nearby Presidio of Tucson was built. To protect the Presidio, a sentinel was posted on the top of the peak to search for raiding Apache warriors. Thus the name Sentinal Mountain. A Mountain Tucson is made up of volcanic rock from the various volcanic activity. Interestingly, A Mountain is not a volcano. But layers of volcanic rock extended out west towards the Tucson Mountains and east into the Tucson Basin. This area is now the City of Tucson. Erosion and faulting are the cause of the mountain’s location in Tucson and its conical shape. It sits on a foundation of bedrock and is dominated by 20 to thirty million years old volcanic rocks. To us, you are not just another real estate transaction. You are a client and, future friend. We strive to create a relationship that continues long after you move into your home. Review our profiles. Check out our backgrounds, education, and certifications. We help you find deals on tile and paint you need to create your perfect home in Tucson. Our professional service backgrounds mean we put you first! We will come back and review our analysis and marketing program with you. Getting the right price is critical. The right price combined with solid marketing program gets your home sold – FAST! A Mountain is a part of Tucson’s history. Tucson Arizona is a great place to visit and a better place to live. With over 330 days of sunshine outdoor activities are always available. Want to know more about homes in Tucson for sale? As top Tucson Realtors, we can help!